With 50 years experience in the passenger transport business Mullany's Coaches is the largest independent operator in South West Hertfordshire and has built a reputation for safety, comfort and a friendly, efficient service. We offer a comprehensive range of services ranging from local shopper buses, to the provision of touring vehicles for contracts with large touring companies. Our coaches and buses are available for private hire and we are experienced with the needs of private individuals and companies large and small. So, whether you have a large or small group, are looking to travel in comfort or on a budget, locally or across the UK, Ireland or Europe we are sure we will have a vehicle to suit your requirements. At Mullanys we are in an enviable location just 500 yards off Junction 6 of the M1, 1 mile off Junction 21A of the M25 and 20 miles from the heart of London we can be with you in no time at all! In addition, with Luton and Heathrow on our doorstep and being within easy reach of Stanstead and Gatwick we are well placed for airport transfers. I am delighted to say that our 'Big Day Out' at Allianz Park was a great success. I would like to express my thanks to you and to all your drivers who did a tremendous job. At Mullany's Coaches we understand that it does not matter how much you invest in your vehicles, without the right drivers you will never provide the level of service customers are entitled to. Our team of professional friendly uniformed drivers have many years industry experience in dealing with all types of groups and will be more than happy to help and assist you with any travel requirements to make your trip a resounding success. We are proud of their knowledge of the many towns and cities that they visit both in the UK and Europe and this is reflected in the many letters of praise that we receive. We also understand the importance of training and are committed to continual personal development, whilst also ensuring compliance with the necessary legislative training requirements. Interested in working for Mullanys? 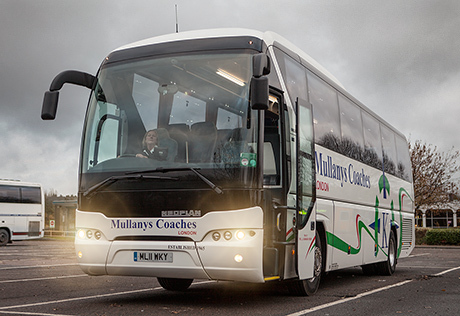 Whether you are looking for full or part-time work and are a bus or coach driver, if you would like to be considered for a role as a bus or coach driver with Mullanys Coaches simply click on the and fill in the application form and one of our Operations Managers will be in touch.